From left to right: John Ciafone, Gus Prentzas and Costa Constantinides, the Democratic candidates competing for Astoria's City Council seat in the primary election. 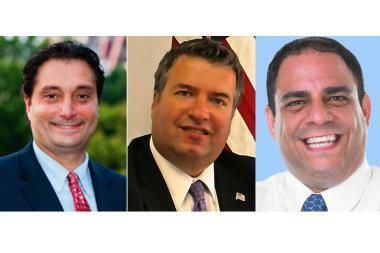 ASTORIA — Three Democrats will compete in Tuesday's primary for Queens City Council District 22, vying for the Astoria seat currently held by term-limited Peter Vallone Jr.
John Ciafone, Constantinos "Gus" Prentzas and Costa Constantinides are in the running, and the winner will go on to the general election in November against Green Party candidate Lynne Serpe, Republican Daniel Peterson and Independent Danielle De Stefano. Of the candidates squaring off Tuesday, Constantinides has raked in the most campaign cash, raising more than $134,000, recent filings show. He's also earned a slew of endorsements from unions and other Queens officials. "We have a large reserve of support," Constantinides said. "I'm feeling very humbled by the whole experience." Constantinides said his legislative priorities would include improving local schools, hiring more police officers and advocating for better hospital services, including the planned expansion of Mount Sinai Queens. A Democratic district leader and deputy chief of staff to City Councilman James Gennaro, Constantinides said his experience in public service is what sets him apart from his rivals. "My breadth of experience," he said, of what makes him the best pick. "Working in the City Council for close to seven years, being a Democratic district leader, being a civic leader, being a progressive leader." Though Constantinides has a wide swath of political supporters, rival Ciafone says he's confident voters will "make an educated decision," and vote based on merit, not on the number of endorsements. A longtime Astoria attorney, Ciafone has run for City Council before, having run against Vallone in 2001. He served previously as president and treasurer for the local Astoria school board — before school boards were replaced by Community Education Councils — where he advocated for uniforms and more crossing guards in District 30, according to his website. If elected, his priorities would include battling crime, improving schools and transportation, he said, but his main concern would be fighting for more affordable housing, particularly for seniors, included in future Astoria developments. "It’s a very popular neighborhood — the rents are just skyrocketing," Ciafone said. "You can't displace people, you can't get rid of the people that have been here for generations and generations." Gus Prentzas also had a long tenure serving on the now-defunct District 30 School Board, to which he was elected in 1991 and served as vice president for seven years. He says education would be one of his top priorities if he's elected, and that he wants to tackle school overcrowding and make sure classrooms are equipped with technology like SMART Boards. Prentzas says he also wants to be an advocate for neighborhood small businesses, one of which he owns — he ran a flower shop on 30th Avenue for years, which he and his wife are now turning into a frozen yogurt place. The candidate says he wants to make the city "a little more understanding" toward business owners, who are often plagued by overly punitive fines and an arduous permitting process. "Small business have become a cash cow," for the city, Prentzas said. "They're forcing a lot of small mom-and-pop stores out of business." He says his experience as a member of Community Board 1 for the last 10 years has enabled him to deal with a broad range of community issues, and gives him an edge over his fellow candidates. "I've been involved in the community — I've been aggressively involved," he said. "This is what makes me more qualified than my opponents."